I hand stoned the jacket to look like a ribcage, added the shoulder decorations ( they are Christmas ornaments! ) I already had a pair of fitted silver shiny jeans so I hand stoned those to look like skeleton bones down to my feet. 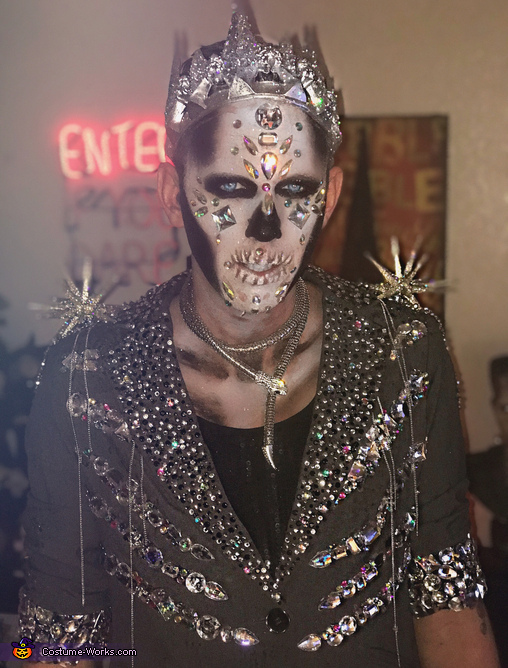 I also had the crown from a previous year, it was gold so I spray painted it silver and added iridescent glitter to match the hologram stones on the jacket. I also did the make up and face stones myself. I had several pieces of rhinestone jewelry on, rings, bracelets, etc...The costume was extremely sparkly with any movement!